The Yorkshire Dales has some of the most spectacular mountains in England. While the mountains of the neighbouring Lake District may be higher than those in the Yorkshire Dales there are few that match the remoteness and distinctly shaped spectacle of those such as Ingleborough and Pen-y-ghent. These two hills are guaranteed to make any visitor fix their eyes on them as soon as they come into view. Wild Boar Fell is another which by its very distinctive profile draws the eyes upon it and it makes any discerning walker want to climb it. And there are more besides. In fact there are 41 mountains in the National Park which attain the official British classification with a height of over 2,000 feet above sea level. All 41 are listed here with details on their height in metres and in feet and each hill has its Ordnance Survey Grid Reference listed so you can search it out for yourself on a map. Finally, note there is one other hill in the list, the only one below 2,000 feet high which I just had to add because of its character. 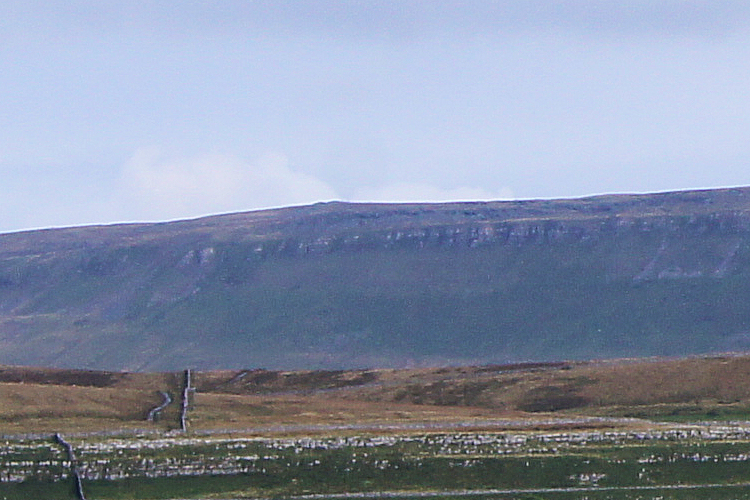 It is instantly recognisable Little Whernside. So on this page you will find 41 moutains and one lovely hill to climb. Go on, get out into the Yorkshire Dales and climb them all. You will be glad you did. For your information the mountains are listed in order of size and all can be found on the accompanying interactive map. Note: Click the link on each grid reference point for a GPS (.gpx) file which indicates the location of the particular mountain. 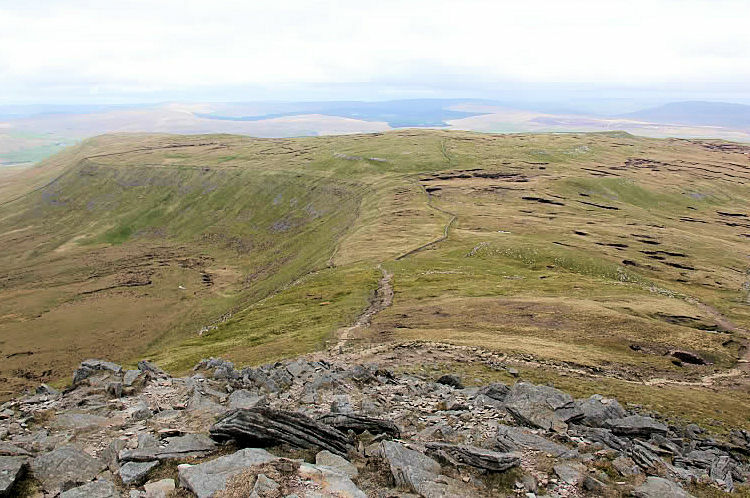 Despite being tagged as the unfashionable one of the Three Peaks Whernside holds the glorious distinction of being the highest hill in the Yorkshire Dales. As one of the three peaks it is also one of the most popular hills and from the top there are great views to the east, north and west. Access can be made from various places and a climb up the king of the dales is well worth the effort. Try this walk. 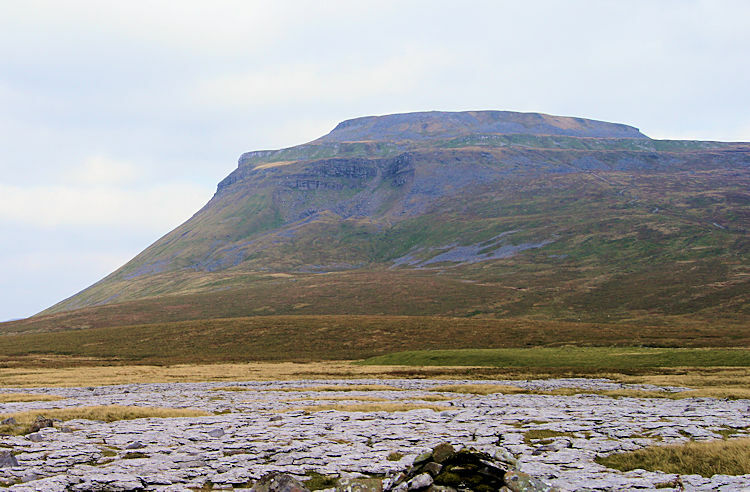 Ingleborough is without doubt the most popular of all the hills in the Yorkshire Dales. It's rounded shape and flat top which was home to an ancient hill fort make it one of the real attractive hills in the park. The most used path (apart from the three peaks walk) is the one from Ingleton with the Clapham route a close second. The views from the top are truly stunning with a particularly marvellous view to Ribblehead Viaduct by looking north. Try this walk. 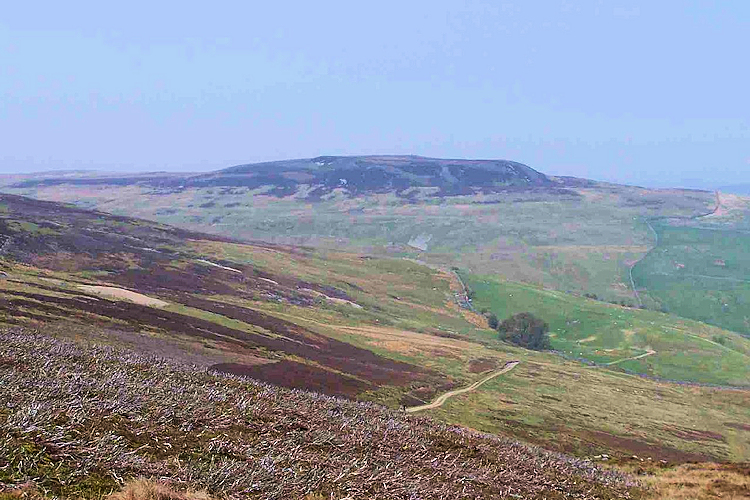 Great Shunner Fell is a giant that provides a feed source for both the River Swale and River Ure. It is often used as a crossing between Wensleydale and Swaledale and as part of the Pennine Way. Whichever way it is climbed the walk is always tough and in inclement conditions it can be one of the hardest to climb in the Dales for at its shortest (Hardraw to Thwaite) it involves a 500m ascent/ descent over a 9 mile trek. Make it a fine day if you can. Try this walk. Close to the hamlet of Outhgill in Mallerstang High Seat is the highest point of a long ridge fell which includes the knolls of Gregory Chapel (695m) and Hugh Seat (689m). There is no marked path on the maps to the summit point but a path from Outhgill heading east up Headley's Gill will get you to within 200 metres of the top. Following the Gill further to its source appears to be the obvious vantage. Try this walk. Wild Boar Fell is a dramatic sight as it is approached and not dissimilar to Ingleborough in profile with a steep side and flat top shape coming into view when approached from the south on the B6259. The classic route up is from Little Ing Farm and ascending west to High Dophinsty before following Scriddles ridge top to Blackbed Scar. Once there you are on Wild Boar Fells table top plateau. Enjoy yourself on the top and visit nearby Sand Tarn. Try this walk. Great Whernside, seen here in the picture from Buckden Pike is the highest point of a eight mile long ridge that separates Coverdale and Nidderdale. It is the most popular climb from the busy walkers town of Kettlewell. And a tough climb it is to as it ascends 500 metres from the banks of the River Wharfe to the summit. 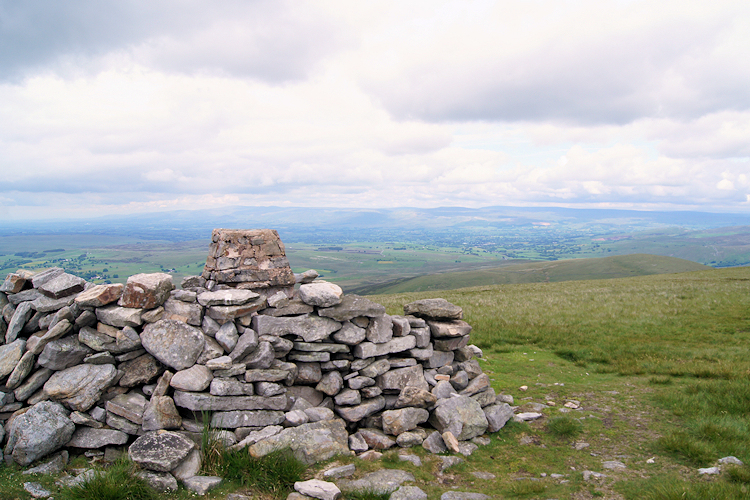 I often do the classic Buckden Pike and Great Whernside circular from Kettlewell. I must do the long ridge soon. Try this walk. Buckden Pike is the only hill I have failed to accomplish on a walking trip for one winters day a few years ago a unforecast severe blizzard drove my pals and I back from our climb. 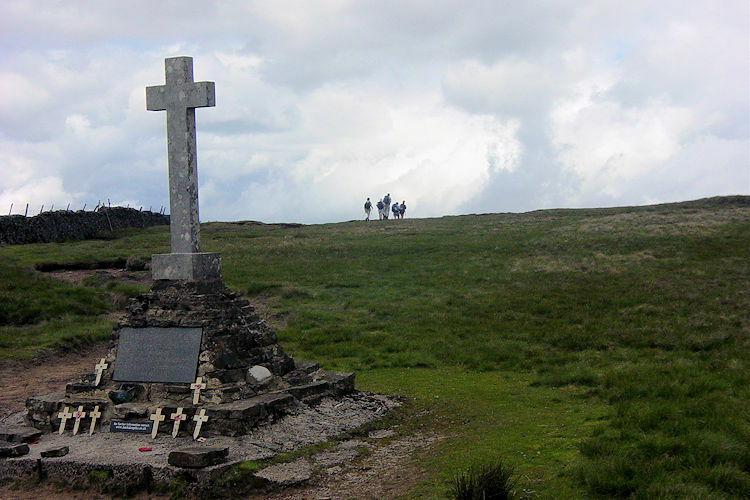 It is a tough hill to climb but worth it if just for the poignant visit to the memorial cross which commemorates the lives of a Wellington Bomber crew who crashed on the Pike during the second world war. A walk to the summit cairn and the cross is a good walk. Try this walk. Gregory Chapel is the middle of three knolls on the High Seat ridge in Mallerstang. To the north is High Seat and to the south is Hugh Seat. The views from the ridge plateau on a clear day are divine with the Howgill Fells, Wild Boar Fell and the North Pennines including Nine Standards Rigg all in sight. The ridge is not often walked because of the remote location and this is a great shame but good for the solitude seekers. (Image courtesy of Wikipedia) / Try this walk. Pen-y-ghent is a marvellous hill. The profile is awesome from most aspects and if you approach it from Horton in Ribblesdale it resembles a sitting lion. And a lion of an ascent it is too for the final push to the top up its southern face is as close to a scramble as one will face in the Dales. Pen-y-ghent is a popular climb and is most busy in the morning for it is traditionally the first of the 'Three Peaks' challenge. Pen-y-ghent rocks. Try this walk. Hugh Seat is the lowest and most southerly of the High Seat ridges three knolls. 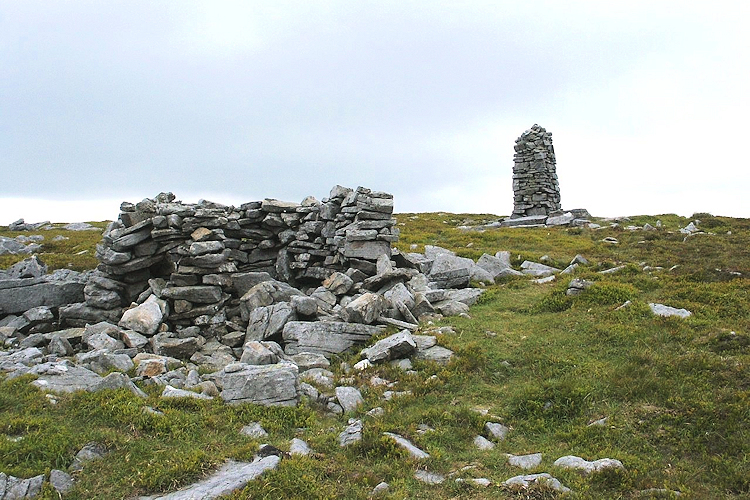 The summit is marked with a cairn as are neighbouring High Seat and Gregory Chapel. The walk on the ridge of all three is almost certain to be quiet as many walkers overlook the range because of its remoteness and because of more illustrious neighbour Wild Boar Fell. Access is good though via the B6259 road that links Kirkby Stephen to Wensleydale. (Image courtesy of Wikipedia) / Try this walk. 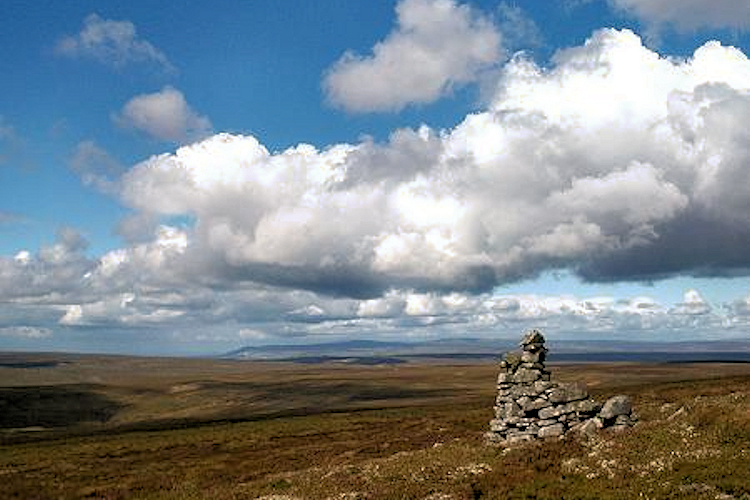 Great Coum is the highest point on a 6 kilometer ridge two miles west of and running parallel to Whernside. 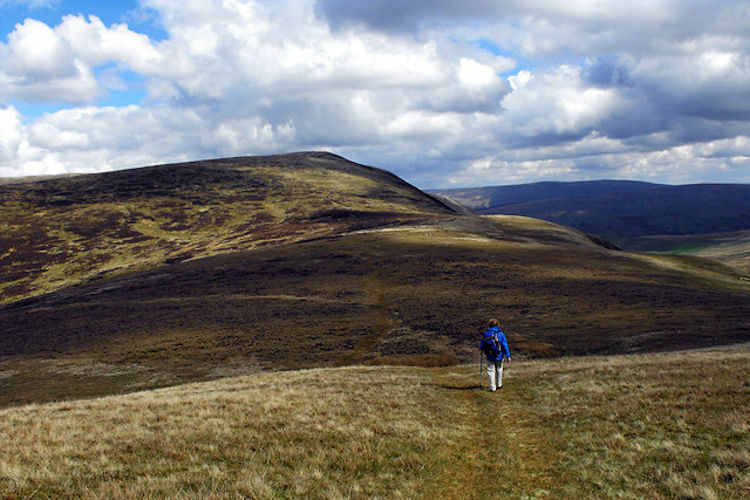 The ridge also includes Crag Hill (see below) and Gragareth which must be three of the least climbed hills in the Yorkshire Dales top thirty. 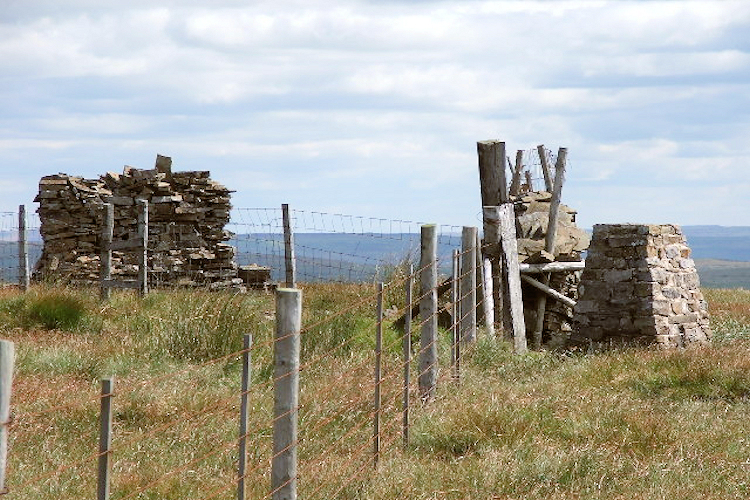 It is probably due to their location on the western edge of the Dales traditional walking area and that is a shame. I made the effort and found myself enjoying a very splendid walk. Try this walk. If you decide to climb Great Coum (see above) then it more than likely Crag Hill will become a notch on your hill walking belt for it is part of the same ridge system and less than one kilometer from the summit of Great Coum. In fact it is more like a two humped 'bactrian' hill than separate hills at all. Yet there are two distinct crests and to a hill climber that means two summits to be climbed. Try this walk. Swarth Fell is the smaller sibling to Wild Boar Fell just as Simon Fell is to Ingleborough and Plover Hill is to Pen-y-ghent. Though attached by the same foothills Swarth Fell is overshadowed by the loftier and lauded bigger brother. 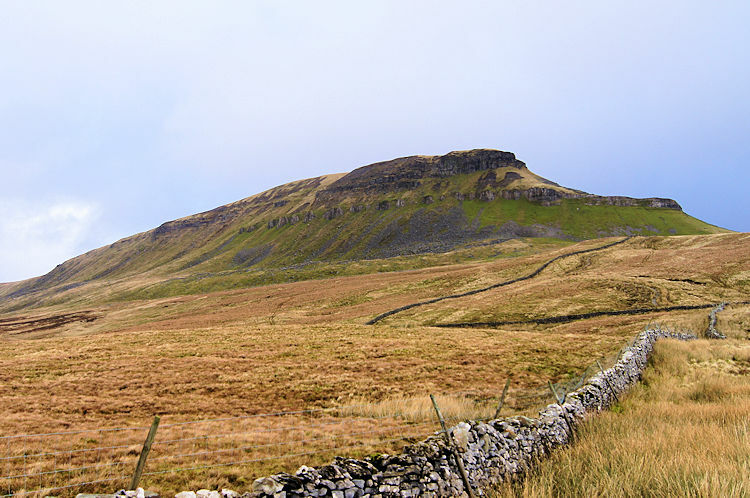 It lies due south of Wild Boar Fell but it is a popular climb as an accompaniment to the scaling of the larger hill. 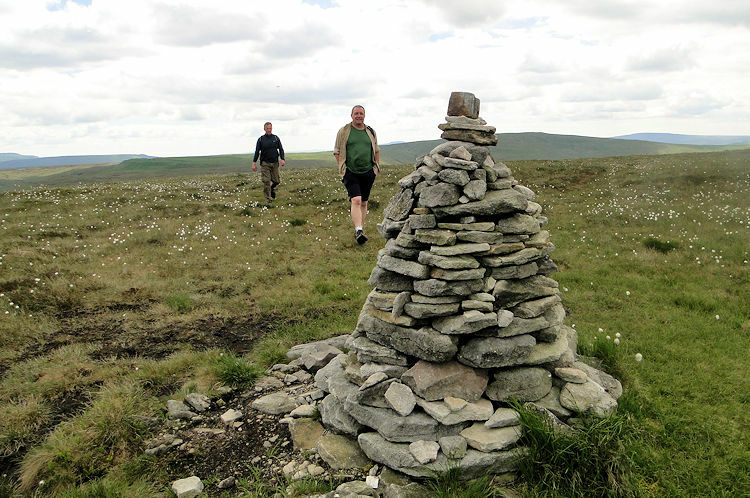 Cairns are placed all over the hill to guide walkers on days with poor visibility. Try this walk. 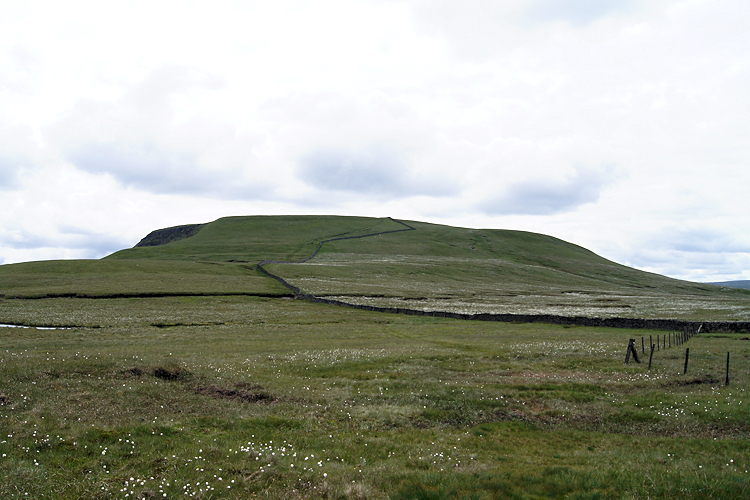 Plover Hill lies at the northern end of the Pen-y-ghent hill. It is often climbed by walkers approaching Pen-y-ghent from Halton Gill but I usually descend it down to Foxup Moor while on a circular walk from Horton. Whichever way it is tackled don't leave the path for it a severely boggy terrain on Plover Hill as rainwater permeates from Pen-y-ghent onto Plover Hills flat high plateau and sits there well into high summer. Try this walk. 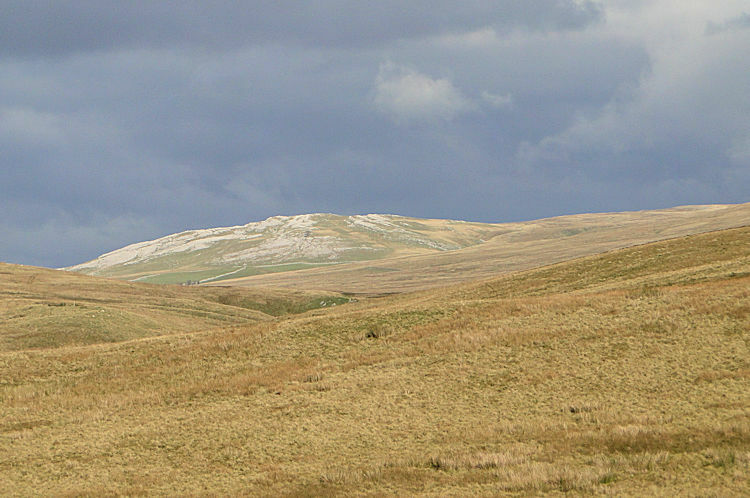 Baugh Fell is an imposing hill to the north of Garsdale. It has a flat plateau summit with rolling humps and a series of summit tarns. 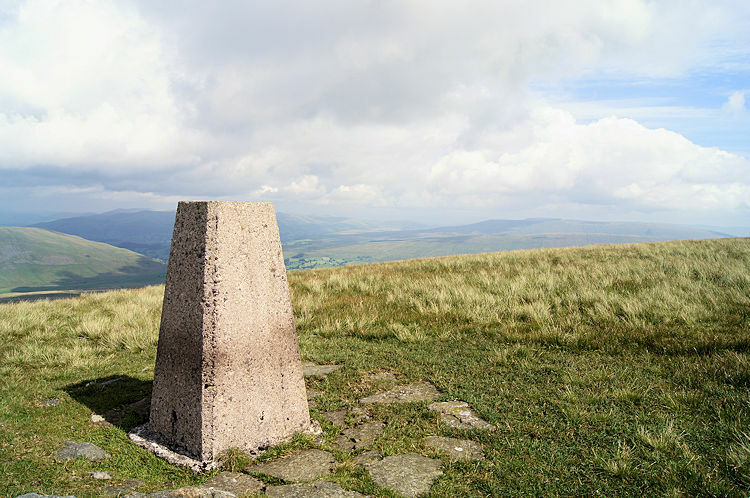 The trig point at Knoutberry Haw (see below) is actually two metres lower than the highest point at Tarn Rigg Hill. 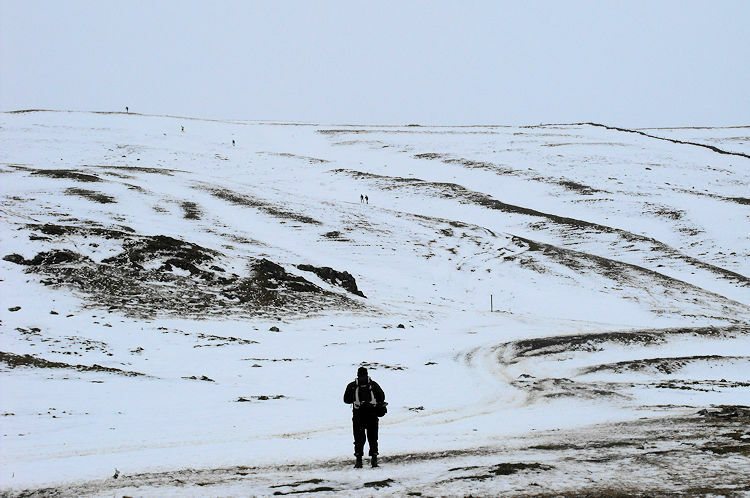 There are no marked paths on the map to this remote hill so expect to be alone on your exploration of it. But explore you must. Try this walk. 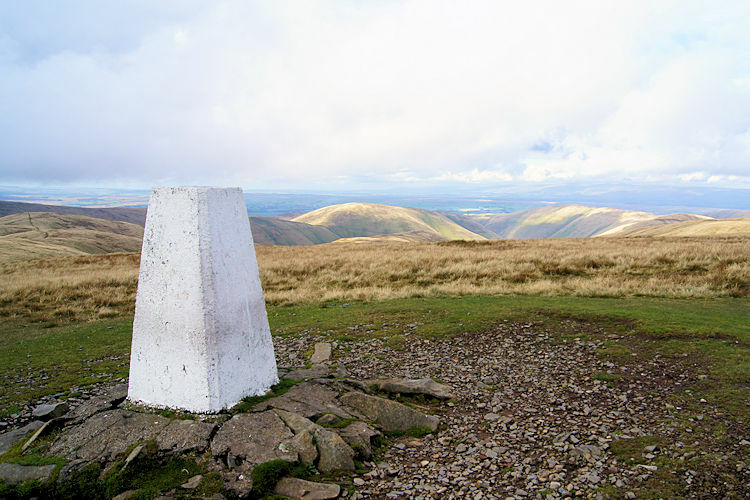 The Calf is the highest point of the Howgill Fells and from its summit the views are truly spectacular. 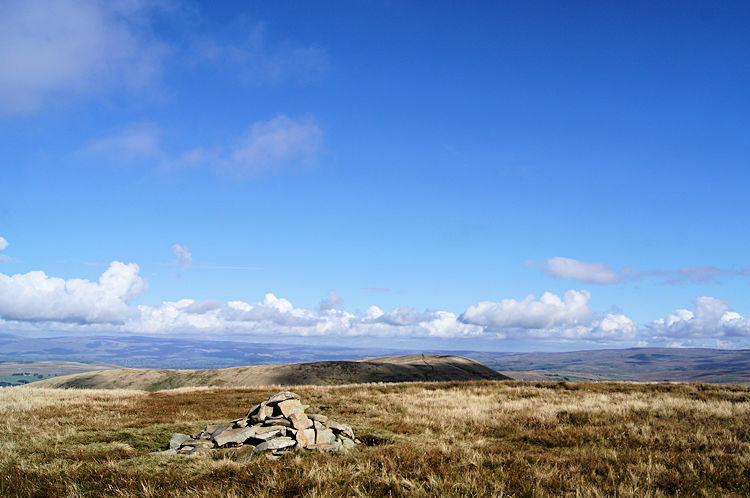 On a clear day the panorama reaches to the Lakeland Mountains in the west, the Eden Valley and North Pennines to the north, and to the east and south you will see many of the Yorkshire Dales finest hills including Wild Boar Fell and the Three Peaks. It is a stunning place and one of my favourite places in the Yorkshire Dales. Try this walk. The trig point at Knoutberry Haw is on the bulk of Baugh Fell and despite having a trig point it is actually two metres lower than the highest point at Tarn Rigg Hill. 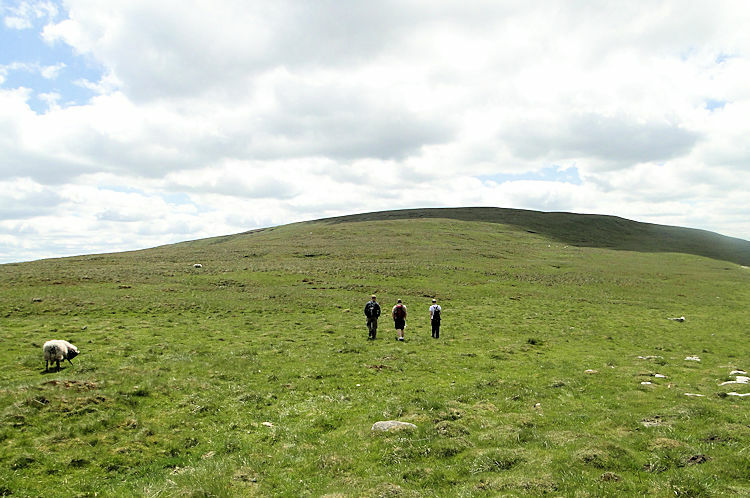 It is an interesting hill to explore for apart from the high points the tarns (East Tarns and West Baugh Fell Tarn) usually attract several species of moorland birds to observe during the exploration of the Fell. Try this walk. Lovely Seat is found on the wild open moors that separate Wensleydale from Swaledale. 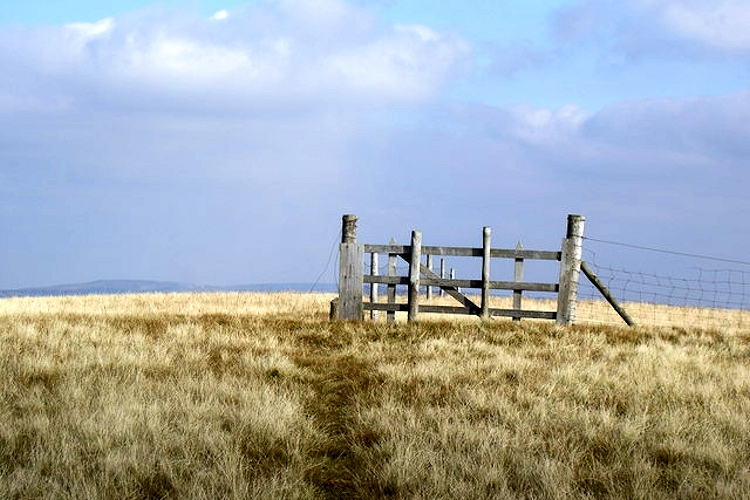 The easiest way to reach Lovely Seat is by parking up at the cattle grid 800 metres south of the scenic viewpoint on Buttertubs Pass and walking east for one kilometer. A far more interesting option is to follow the path north onto the moor from Sedbusk to make a leisurely exploration of the high moorland around Lovely Seat. (Image courtesy of Wikipedia) / Try this walk. 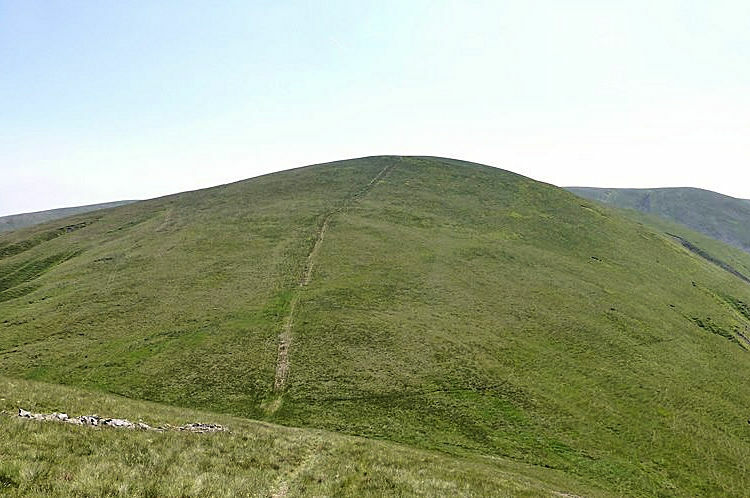 Calders is one of the most walked hill in the Howgill Fells simply because of it has to be crossed if walking from Sedbergh to the Calf. At just two metres lower than The Calf it is almost the highest point in the Howgills. I recommend the alternative linear walk from Low Haygarth to Cautley Beck, then up Cautley Spout to The Calf, then to Calders and back to Sedbergh. Try this walk. Great Knoutberry Hill is an imposing sight for anyone walking on the Dales Way Long Distance Footpath as they walk the long road section from Ribblesdale to Dent Head. The best approach to its summit is from this section of the Dales Way by leaving the path at Stonehouse Farm and following the Arthen Gill path up Dent Fell towards Widdale and leaving it to complete the ascent before returning in the direction one came. (Image courtesy of Wikipedia) / Try this walk. Rogans Seat is a very remote place but easily reached by following the Swaledale Swinner Gill to Gunnerside Gill path and leaving it to follow a bridleway track north for two kilometres. The track is fairly flat but for exploratory walkers the return journey down the same track can be a bore. It was for me. The views from Rogans Seat are not brilliant either as its on a wide flat moorland but despite the drawbacks it has to be achieved. (Image courtesy of Wikipedia) / Try this walk. Bram Rigg Top is one of the Howgill Fells cluster of rounded topped peaks which includes The Calf, Calders and Great Dummacks, all of which are close neighbours to each other. this makes all four easily achievable in a simple walking excursion in the lovely Howgill Fells. I love walking in the area and making it a long weekend of walking by staying in Sedbergh or in Dent. Try this walk. The higher of two fells (Darnbrook Fell being the other) on hillside two miles south east of Pen-y-ghent. Fountains Fell is home to a substantial fell-top tarn. This the fell-top plateau can be wet underfoot for most of the year. 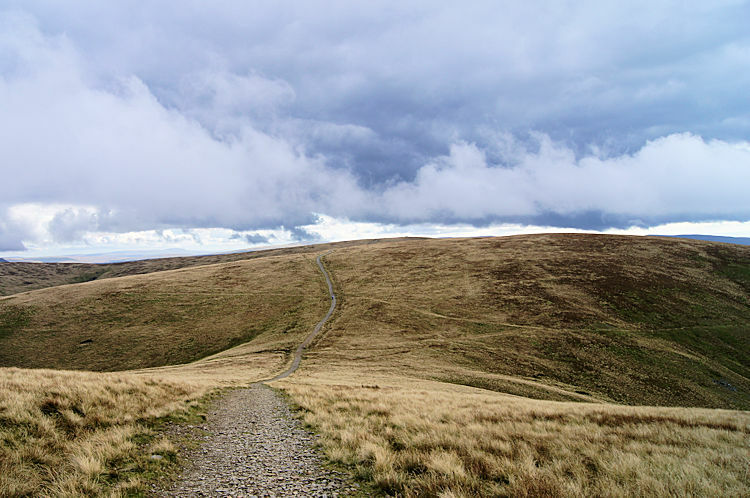 Despite this there are paths crossing Fountains as it is a landmark on the Pennine Way and therefore the fell is often achieved by walkers on their long journey from the Peak District to the Scottish Borders. (Image courtesy of Wikipedia) / Try this walk. This fell with a trig point assisting ease of location stands just 4 metres lower than Rogans Seat on the high ground above East Stonesdale. Water Crag is located just a mile to the north and east of Rogans Seat so it makes sense to visit the both of them in a single walk from Gunnerside or alternatively from Arkengarthdale. Try this walk. 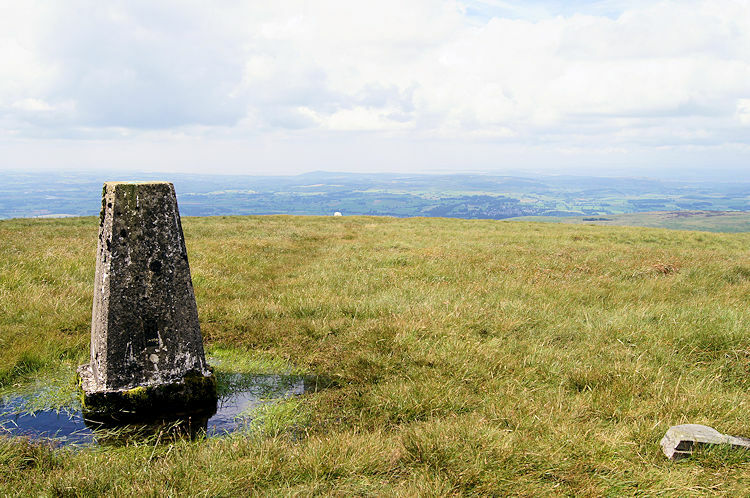 As with Fountains Fell the summit of Dodd Fell Hill is closely passed by Pennine Way walkers as they travel through the Yorkshire Dales on their epic 268 journey. No doubt a short detour is often taken by hill baggers before they drop down from the West Cam Road into Wensleydale at Hawes. The hill itself has a rounded top and can be easily scaled as the top is only 500 metres away from the path and 90 metres further up. Try this walk. 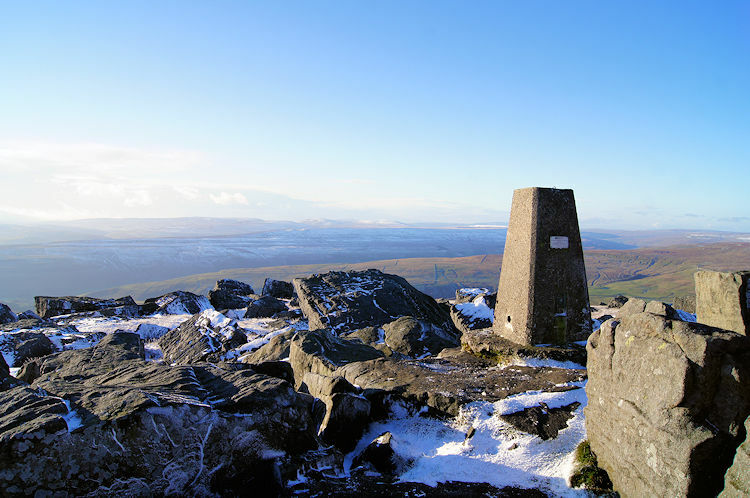 Sails stands on the southern extremity of the long high ridge which includes High Seat, Gregory's Chapel and Hugh Seat. 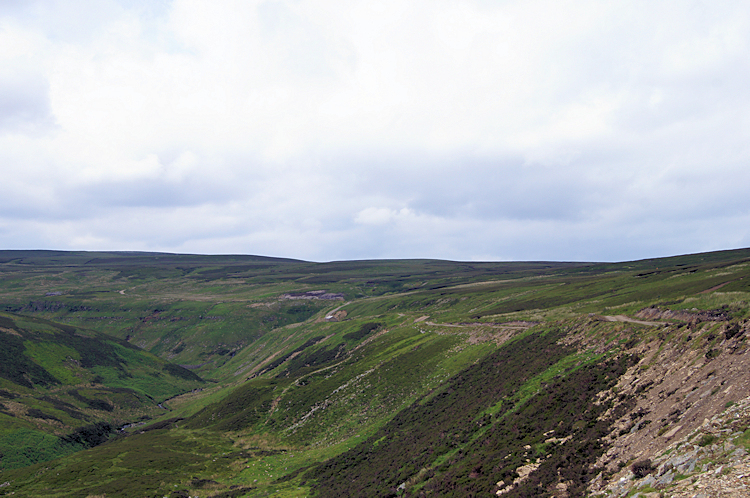 The most obvious walk in to complete all four in one day from Garsdale Head, Outhgill or Nateby. The more adventurous could go for bagging Wild Boar Fell and Swarth Fell two making a unique walk and thus completing a classic Yorkshire Dales half dozen. Try this walk. Great Dummacks is situated just to the east of Calders (see above) in the splendid Howgill Fells and so if you are peak bagging this list then it is best accomplished in a good day on the Howgills when bagging The Calf, Bram Rigg Top and Calders. 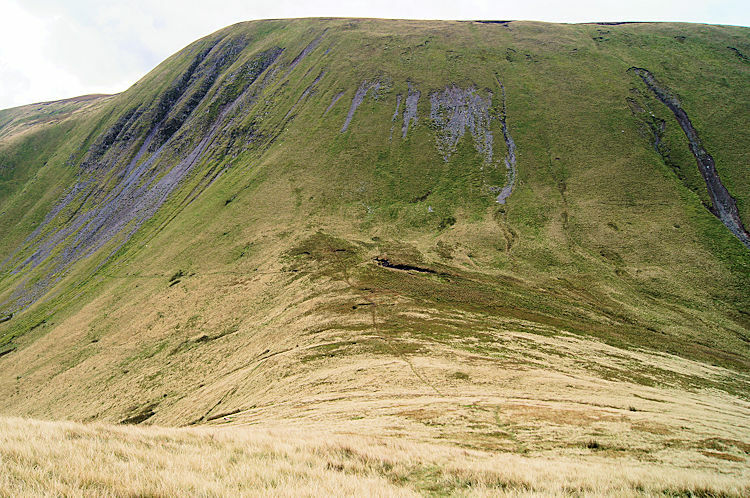 This way you get all four in a walk that can be best done via magnificent Cautley Spout. 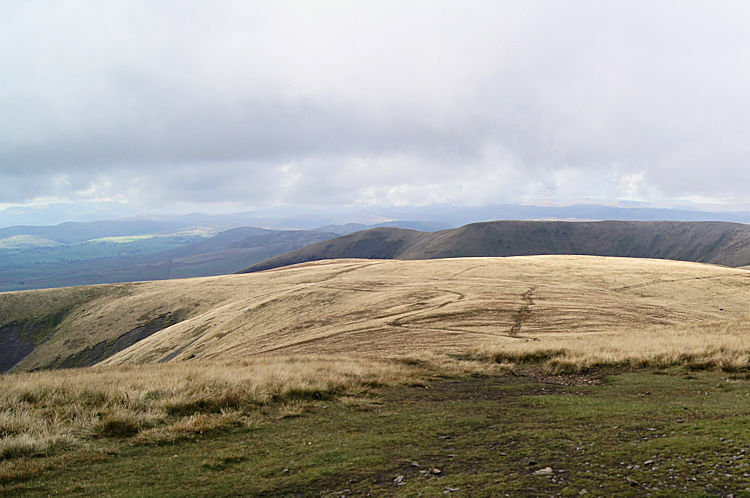 The walk will help you understand Wainwright's view of the Howgills as slumbering elephants. Try this walk. 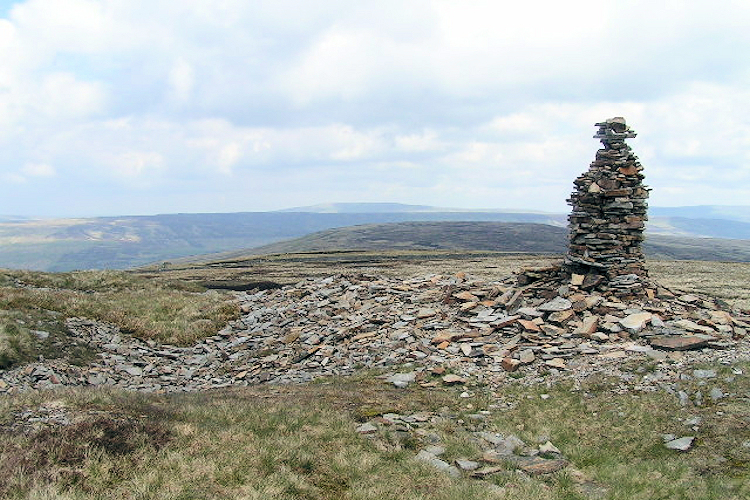 Nine Standard's Rigg is part of the Pennine watershed. It would be one of those hills rarely ascended if it was not for the fact it lies directly on the Coast to Coast, the most popular English Long Distance Path of them all. This factor makes it a well walked hill. 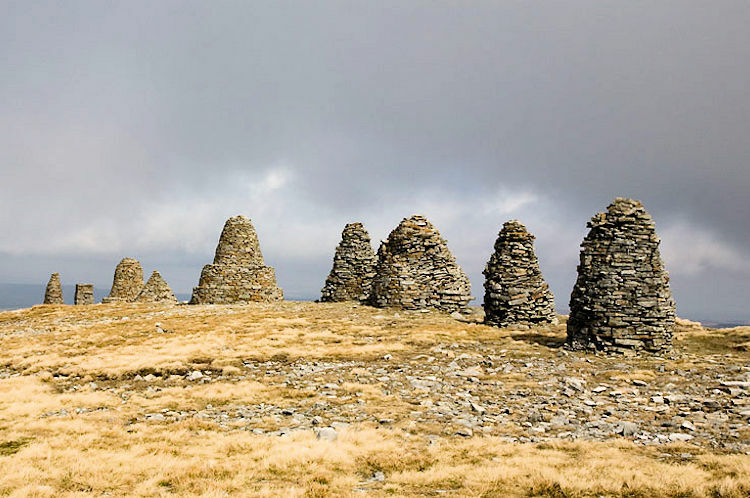 The Nine Standards are cairns which are not as old as they seem, a 19th/ 20th century folly of the hills. However, they do make an imposing sight on the hills east of the Kirkby Stephen. (Image courtesy of Wikipedia) / Try this walk. 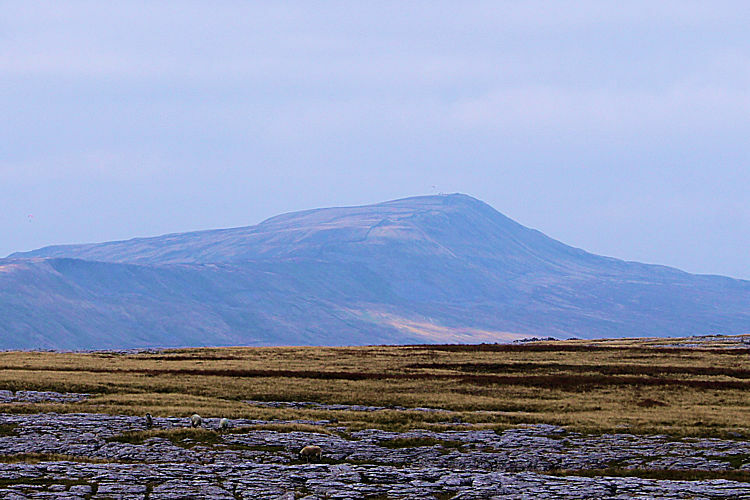 Simon Fell is the central of the three humps in the picture with Park Fell to the left and magnificent Ingleborough to the right (Park Fell is 563m high). All three hills form the Ingleborough system which is best walked from a stile on the roadside of Gauber Road one mile south of Ribblehead Station. Follow a track alongside a wall up to Park Fell and then stick to the undulating ridge top all the way over Simon Fell and further on to Ingleborough. Try this walk. 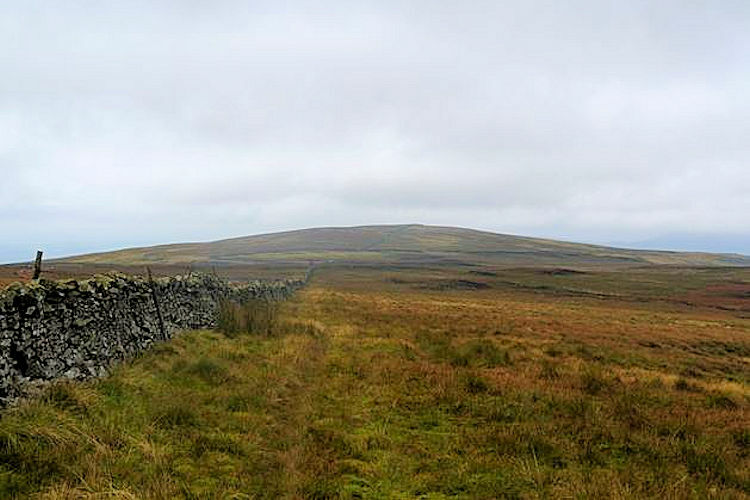 Yockenthwaite Moor sits high north of Langstrothsdale. It is a tough climb from any direction and a no easier to explore one its heights are reached. The easiest option is to follow the Gilbert Lane track from Cray and then track west from the Grey Horse Boundary Stone at the track side. This is the point where least ascent to the trig point on Yockenthwaite Moor has to be made. While on the moor visit South Grain Tarn and Middle Tongue Tarn. Try this walk. 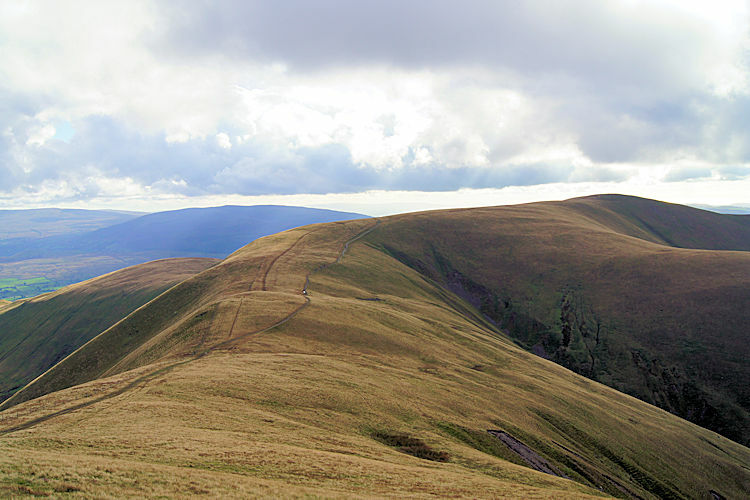 The Howgills are a series of rounded lush grass topped fells and Fell Head is one of seven of them that rise over 2,000 feet. 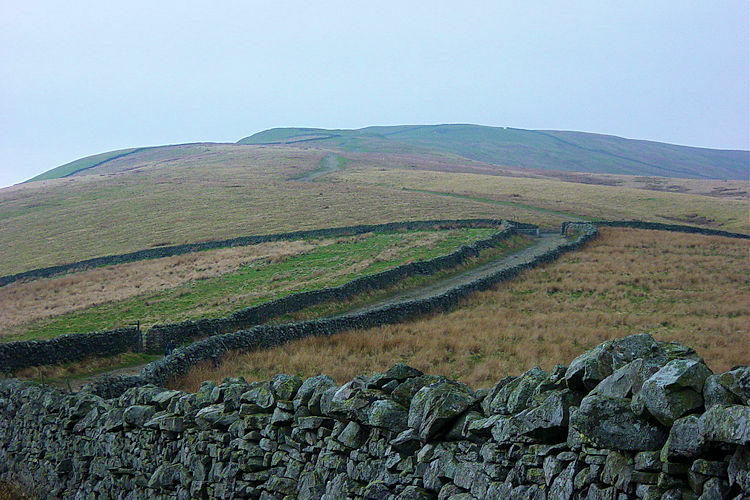 It is the most westerly of the five and is best climbed from Gate House on the Fairmile Roman Road by following the track through Beck House Farm and following it up the fell before leaving it to follow a track up to the cairn summit. Unfortunately the only marked route is by following the track back. Try this walk. Yarlside is the 6th highest of the Howgill Fells and is clearly seen from the Sedbergh to Kirkby Stephen Road. The roadside at Rawthey Bridge is the best access point to climbing Yarlside and is best done in a walk that also includes the 4th highest fell, Randygill Top (see below). There is another alternative starting from Low Haygarth to the top of Cautley Spout a magnificent series of waterfalls and one of the best in the Yorkshire Dales. Try this walk. Green Hill is one of the distinct knolls on the long ridge of the Green Hill, Gragareth and Great Coum range which is the huge hill seen directly west of Whernside with little visited Kingsdale separating them. It is easiest bagged on a ridge walk of the range capturing four of the Yorkshire Dales highest hills on the same walk. Try this walk. Gragareth is at the southern end of the 6 kilometre long ridge which has Green Hill, Great Coum and Crag Hill at its northern end. 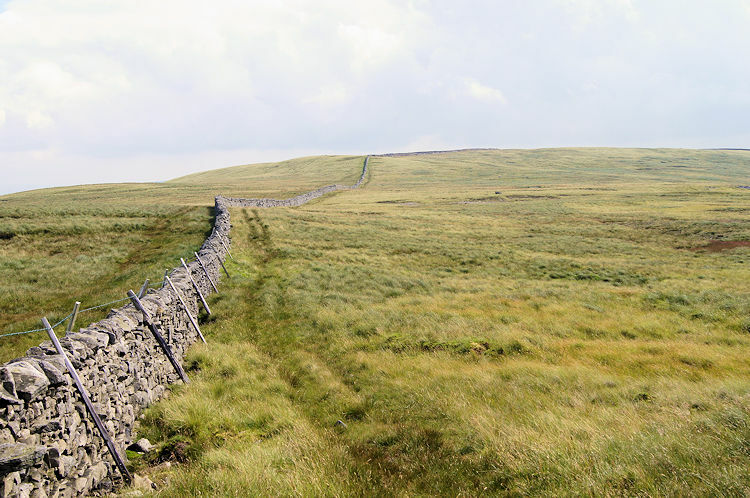 Best do all four in a single ridge walk starting from High Moss near Whernside on the Ingleton to Dent Road. You'll probably have solitude on this isolated range so relax on the ridge and take in the great views while you bag all four. Return from the top of Gragareth by Green Laid Scars and the quiet road. Try this walk. 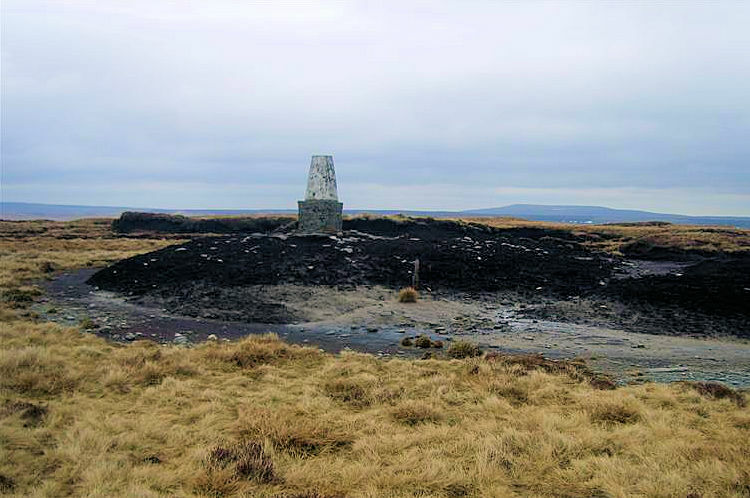 Darnbrook Fell is the smaller sister of Fountains Fell and the summit lies just one mile east along a path off the Pennine Way. From Darnbrook Fell there are magnificent views of nearby Pen-y-ghent to the west and Littondale to the north and east. For a days peak bagging it would not be difficult to capture (in order) Pen-y-ghent, Plover Hill, Darnbrook Fell and Fountains Fell in a single 12 mile circular walk starting from Dale Head (Ref: SD842715) Try this walk. 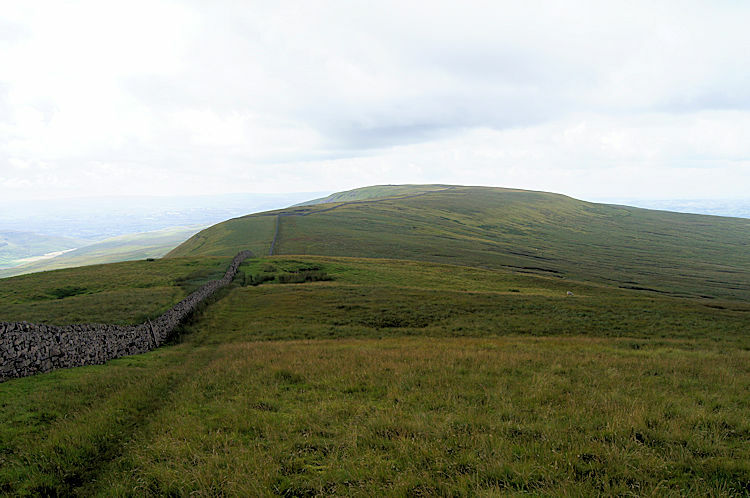 Randygill Top is the most northerly of the 8 Howgill Fells which rise over 2,000 feet. For access there is a route from Rawthey Bridge (see Yarlside above) but the most clearly marked route is by approaching Randygill Top from the north starting at the T junction (Ref: NY699042) on the Ravenstonedale to Weasdale Road and climbing south to Ravenstonedale Common. 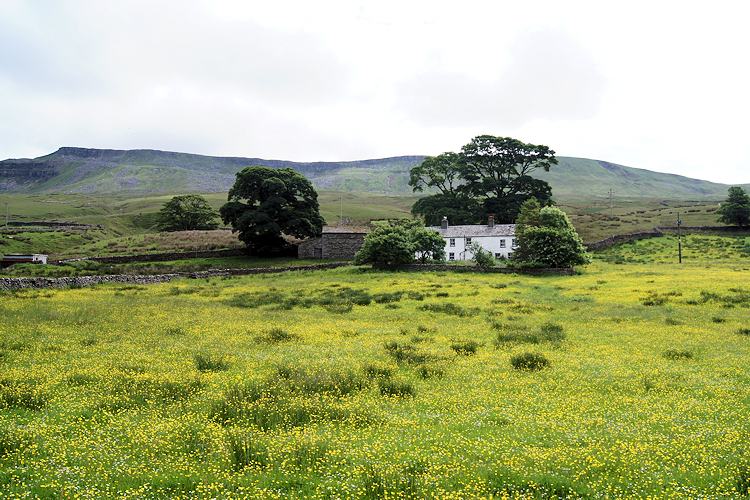 Return by dropping into Bowderdale and following the beck to Weasdale. Try this walk. 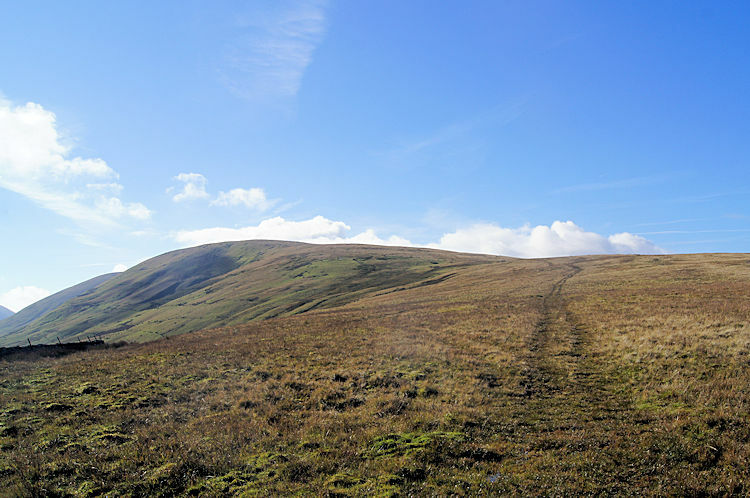 Bush Howe is the lowest of the eight rounded hills over 2,000 feet high in the Howgill Fells. Despite being the lowest of the eight it stands on the same plateau as the highest. The Calf is only less than a mile away to the south east. The other local Howgill is Fell Head, a kilometre due west so there is the opportunity of a straightforward walk to capture a few lovely Howgills in the same delightful walk. Try this walk. Drumaldrace, the high point of Wether Fell stands close to the Cam High Roman Road path linking walkers to Wensleydale and Ribblesdale. Walkers wishing to bag the peak need only make a very short detour from the path of 200 metres to the cairn at Drumaldrace. The fell is the last of the Yorkshire Dales fells over 2,000 metres so now you know them all the next thing is to get out there and bag the full set. Try this walk. 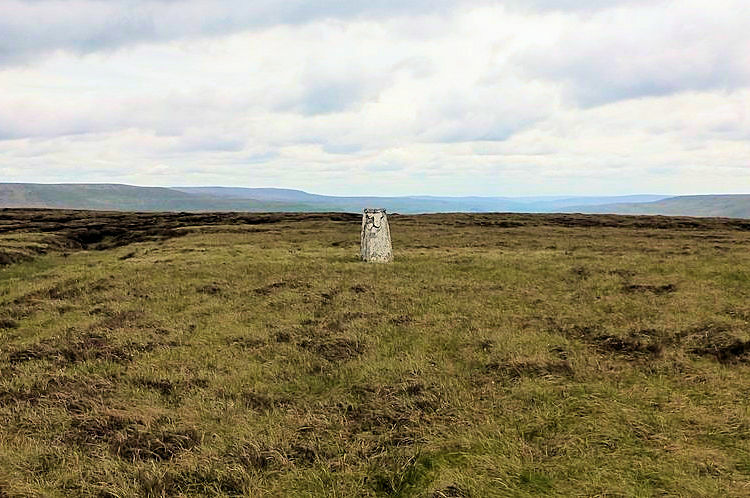 Birk's Fell is the highest point on well known Old Cote Moor which is the range which forms the lofty barrier between Wharfedale and Littondale. The high point is near to Birk's Tarn between the trig points at Horse Head and Firth Fell. I love walking on Old Cote Moor and I will always remember once bouncing across the moor with a crust of ice holding me up on top of the springy ground underneath. Try this walk. Calf Top is the highest point of Middleton Fell range which form part of the boundary of the south-west Yorkshire Dales. 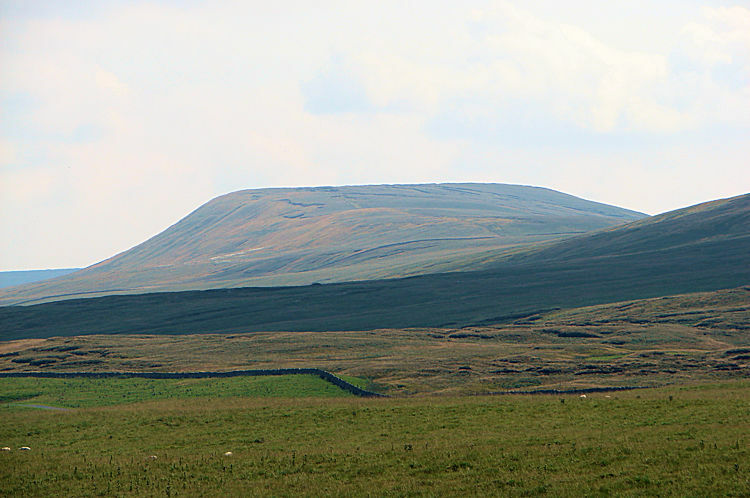 The fell can be seen from Kirby Lonsdale in south-east Lancashire. It is a remote place, isolated from the neighbouring Barbon Fells by the narrow Barbondale valley, the lonely road within it linking Dent in Cumbria to Casterton near Kirkby Lonsdale. (Image courtesy of Gordon Mabson) Try this walk. While Little Whernside does not reach the exalted height of 2,000 feet it is one of those hills in the Yorkshire Dales which inspires walkers to climb it because of its super profile. 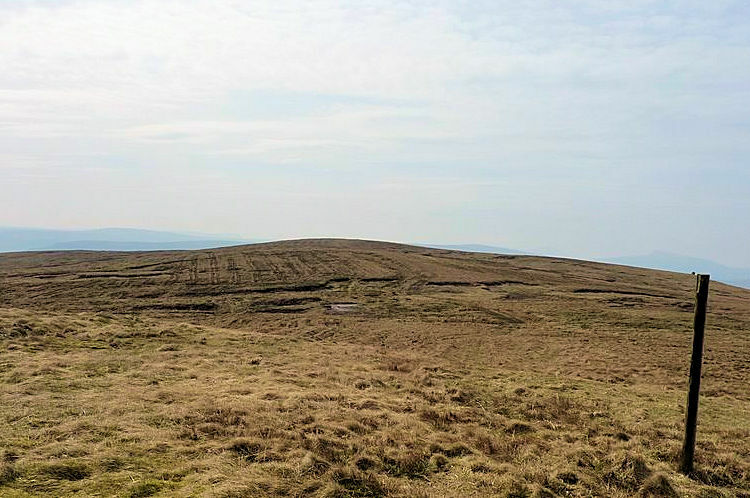 Part of a long ridge which includes Great Whernside, Dead Man's Hill and Great Haw it can be easily climbed from Braidley in Coverdale or from Little Hunter Sleets, both starting points being at roadside on the Kettlewell to Middleham Road. Try this walk.